Using this jpg export extension off of GitHUb, I am not getting any results. My OS is Windows 10 64bit. I tried all the options in the window, but nothing was exported. I'm wondering what others did to export to JPEG successfully? 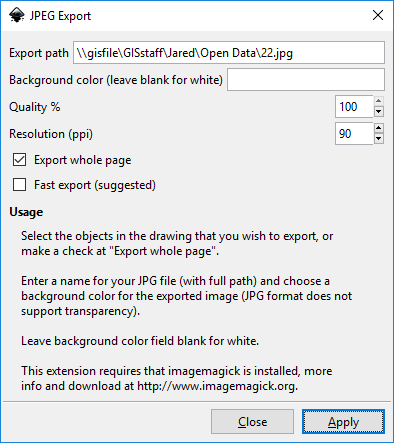 Browse other questions tagged inkscape jpg or ask your own question. How do I trace this bitmap with JPEG artifacts? Why does JPEG make fonts and typography blurry? How to export list of objects in Inkscape?